It looks like we here at FootyFair are going hi-tech. With the help of some "friends in high places" we have created a custom football simulator software just in time to predict some scores for the 2016 Euros in France. Our simulator takes into account the FIFA and ELO rankings, head-to-head records, player chemistry and historic performances in major tournaments as well as friendly matches. So without boring you to death, here are FootyFair's simulations of the 2016 Euro Group A matches. Stay tuned for the Group B results tomorrow! Hosts France kicked-off the tournament in the only match of opening day. 37 minutes into the match Romanian winger Gabriel Torje put Romania up front to silence the French supporters, taking the 1-0 lead into half-time. But the French replied quickly with Juve's Paul Pogba leveling the score less than a minute into second-half. In the 77th an Olivier Giroud would seal France's victory in come-back fashion. Minnows and first time participants Albania showed strong team-spirit in the first half as they were able to overcome many chances from the Swiss to keep the score at 0-0. In the 61st the Swiss got their breakthrough however, with Bayer Leverkusen's Admir Mehmedi slotting the ball in the back of Albania's net. But the "Eagles" were not to be outmatched on the day as an 81st minute goal from Swiss born Taulant Xhaka leveled the score to award the Albanians with a point in their first ever major tournament. After conceding twice against the tournament's hosts Romania's solid defence was back at it against the Swiss, avoiding any meaningful penetration. In the 54th minute Claudiu Keșerü scored the lone goal of the match to hand Switzerland a blow in their attempt to make it out of the group into the next stage. A shocker in France's second match as first time participants Albania took a quick lead in the very first minute with Taulant Xhaka scoring his second goal of the tournament. The French were able to reply within 20 minutes as Dimitri Payet scored from a free-kick from outside the box. But the long-shots were not done, snatching a winner when another Swiss born Migjen Basha scored in the 62nd minute; handing Albania a historic victory in Marseille. Unfortunately for the Swiss, the loss against Albania seemed to inspire the hosts with France controlling the entire match. Dimitri Payet scored his second of the tournament in the first half, while an own-goal from Swiss in the second secured the victory for the French. 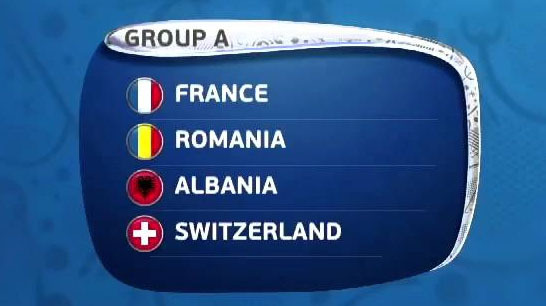 Switzerland meanwhile were confirmed as Group A's last place team, picking up a lone point in their 1-1 draw against Albania. Everything to play for with the Romanians and Albanians with a good shot at second place, and so was the match, an open affair with both teams looking to get on the scoreboard. The Albanians managed the only goal of the first half with Taulant Xhaka picking up his third in as many games. After the restart, the Albanians seemed to still ride the high of their shock win over the French as striker Armando Sadiku slotted the ball in the back of Romania's net to give Albania the 2-0 lead in the 50th minute. The Romanians would respond however and would come all the way back to draw the match even with goals from Bogdan Stancu and Florin Andone, a result that put the Albanians in 2nd, with Romania having a great chance to qualify to the next stage as a 3rd place team with 4 points. While the hosts had a hiccup in the form of a loss to the Albanians, it was the Swiss outfit that disappointed the most, having been unable to pick up a single win. Albania showed that their qualification was no "fluke" as they and the French were guaranteed a spot in the quarter-final, while Romania will have to wait to the conclusion of the first round to find out if their 4 points will be enough to put them through as one of the four best 3rd place teams.